On Saturday night I joined the sea of purple for Throwback Night at Chase Field. The main event was a post-game Alumni Game featuring some D-Backs greats. I got down there early and was able to get a few autographs for our Diamondbacks collection. I also hung out with Daniel from It's Like Having My Own Card Shop again so that was great too. First up is former D-Backs starting pitcher, Elmer Dessens. 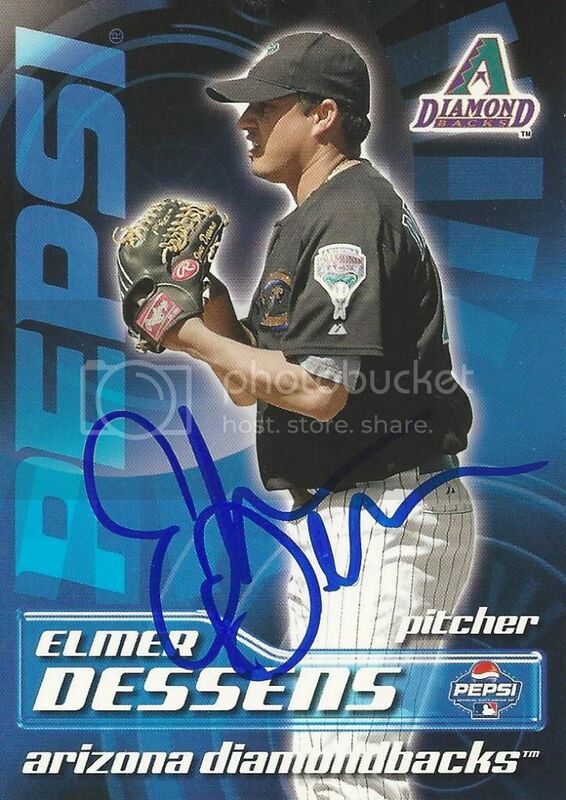 Elmer signed his 2004 Upper Deck Pepsi card for us. These were inserted into 12 or 24 packs of Pepsi cans. Elmer started 39 games for Arizona over parts of two seasons. He won 9 games and struck out 168 batters. It was fun hanging out! I really like this card! i wish Pepsi was still making D-Backs sets. Agreed on all three points!